These are our standard square tube inserts. 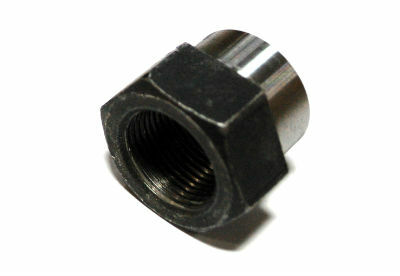 We offer them for 2x2 1/4 square tubing, 1.5x1.5, 1/8 square tubing, and 1.5, .120 wall DOM tubing. They are all CNC machined for a press fit into the desired tube. We press them in with a hydraulic ram, however a 5 lb sledge hammer will knock them in. Once you press them in, check to make sure they are square, then fully weld them. All nuts are machined from grade 8 Hi-nuts. Premium version LH & RH are available in 1" 14 size.